I couldn't be more stoked to participate in this year's Canadian Music Week after finding out that Japan was in the spotlight this year. Last year, only two Japanese bands, Rize and Fade, made it to CMW, who I was fortunate enough to interview and review. This year's Canadian Music Week is more enthralling than ever. 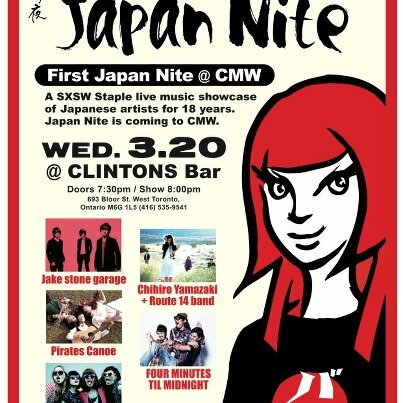 One of the reasons is CMW is going to host the very first Japan Nite in Toronto. Japan Nite is the best known during SXSW, where a number of Japanese artists showcase their mind-blowing performance to the North American audience during the endless nights of the festival. My favorite band of all time, GO!GO!7188 has participated in the past. This year, Japan Nite has extended their legs over to the Canuck Land for the first time with Jake Stone Garage, Josy, Chihiro Yamazaki +Route 14 Band, Four Minutes Til Midnight, and Pirates Canoe at Clinton tomorrow night, Wednesday, March 20th. It's only $10 at the door or you can grab a wristband to check out countless performances across the town this week.